Note from Editor: The core of this article appeared in the South Eastern Pennsylvania Garden Railway Society newsletter in August, 2004. I have some other articles about locomotives to post, but this one seemed timely in light of recent Large Scale and On30 articulated locomotive offerings by Bachmann. Uncharacteristically, the fellow who was editing the newsletter at that time did not keep a record of who actually wrote the article. So if you know who actually wrote this article, please let me know, so I can ask permission (belatedly) and give credit where it is due. Designed by the locomotive engineer and inventor Anatole Mallet (1837-1919), a Mallet-type locomotive is a four- cylinder, compound articulated locomotive. 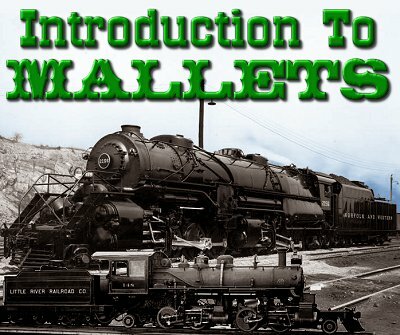 Mallet locomotives have essentially two steam engines mounted under the same boiler. The rear engine is rigidly attached to the boiler, while the front engine is able to swing laterally around a pivot point located near the rear, high-pressure cylinders (see Figure 1 below). This articulation allows the locomotives to negotiate curves that would not accommodate a large rigid-frame locomotive. On a compound Mallet, live steam from the boiler powers the rear cylinders. Then the exhaust from the rear cylinders powers the forward low-pressure cylinders (see Figure 2 below). To compensate for the lower temperature and pressure of the exhaust steam, the low-pressure cylinders are much larger in diameter that the rear set. This compounding system allows for savings on fuel and water, however the difficulties in setting valves to deal with the volume of low pressure steam, and the slow speeds of compound Mallets led to most American railroads abandoning compounds by the 1920s. Exceptions to this were such locomotives as Norfolk & Western’s famous Y-class 2-8-8-2s, which were still being built as compounds into the 1950s, and of course the logging Mallets, of which all but six were compounds. What distinguishes this locomotive from other large steam engines is that not only are there 4 cylinders and four sets of driving wheels, but also that the steam is used twice, first by the high pressure cylinders, then by the low pressure cylinders. The result is an engine with great pulling power, though not great speed, and moderate efficiency compared to a standard 4 cylinder engine. The LGB Uintah Mallet is not a true Mallet. This is because it has 4 equal-sized cylinders, and the steam to each is used just once before being exhausted up the stack. It is articulated, meaning that the front drivers can pivot for following winding tracks, but it is not a Mallet. Think you have all the Mallet answers? Test your knowledge by answering the questions below. You can find the answers toward the end of this article. Which Mallet got all the press? No hint needed. Which Mallet took the winters off, and regularly pulled its loaded consist downhill? If you count only engine and tender and do not add an auxiliary water tender, which Mallet was the longest of all piston driven steam engines? Hint, it regularly ran at 80 mph. If you count only engine and tender and do not add an auxiliary water tender, which Mallet was the heaviest of all piston driven steam engines? Hint, it could do 100 mph, downhill! Which Mallet had the highest horsepower rating of all piston driven steam engines? Hint, 7498 Hp. Which Mallet had the highest starting capability of all piston driven steam engines? Of all super powered heros, which Mallet had the highest starting capability of all piston driven steam engines? Hint, big boy produced 5300 Hp at 25 mph. This puppy also produced 5300 Hp at 25 mph! Which Mallet had the largest number of its class built and simultaneously operated by a single company? This Mallet was known to wander. Why? This Mallet had the most wheels. These railroads built engines that looked like Mallets, but were rigid frame monsters. Please name all the rigid flavors. The answers are further down the page. HO and N have had many mallet models for decades, including Big Boys, and 2-8-8-2s patterned after the N&W Y6B engines. But since my pages serve mostly O scale and larger modelers, here are some articlulated models worth your consideration. They're not all technically Mallets, and some of them can be hard to come by, as they come in and out of production. But they're all really big fun. Bachmann's Large Scale 2-6-6-2T represents a number of industrial locomotives that were used throughout North America, especially on mining lines, where the trains were short, but very heavy. It is Narrow Gauge, about 1:20.3 in scale. LGB's Uinta Valley 2-6-6-2T is one of LGB's most popular locomotives ever, recently reissued with a green water tank as shown. LGB's Sumpter Valley 2-6-6-2 is another example of a light industrial articulated. MTH's 1:32-scale Big Boy is based on most popular articulated locomotive, and the longest, if you don't count the extra tenders some really big locomotives took along. This model is 53" long, counting the tender.